Some “Fishy” Business in Buffalo. Sometimes I work so hard I forget to enjoy the moments along the way, but that is not what happened last Thursday in Buffalo. 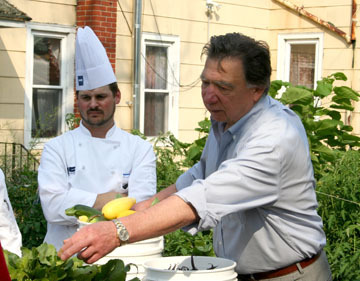 Several of Delaware North’s chefs teamed up with me to put on a fundraiser for the Massachusetts Avenue Project and its new sustainable food production system. We worked hard – but we also had a great time. Me with Scott Green looking on. I’ve said it before and I’ll say it again, it was some “fishy” business our culinary team put together at the fundraiser. The Massachusetts Avenue Project owns a one-half-acre organic urban farm and greenhouse where they produce fruits, vegetables, herbs eggs and fish for the surrounding community and local restaurants. Currently, the farm can produce 2,000 tilapia, but with the money we raised, they’ll soon have a new greenhouse that can house 35,000 tilapia. Delaware North is looking to further partner with the project as part of our constant efforts to be sustainable and green. 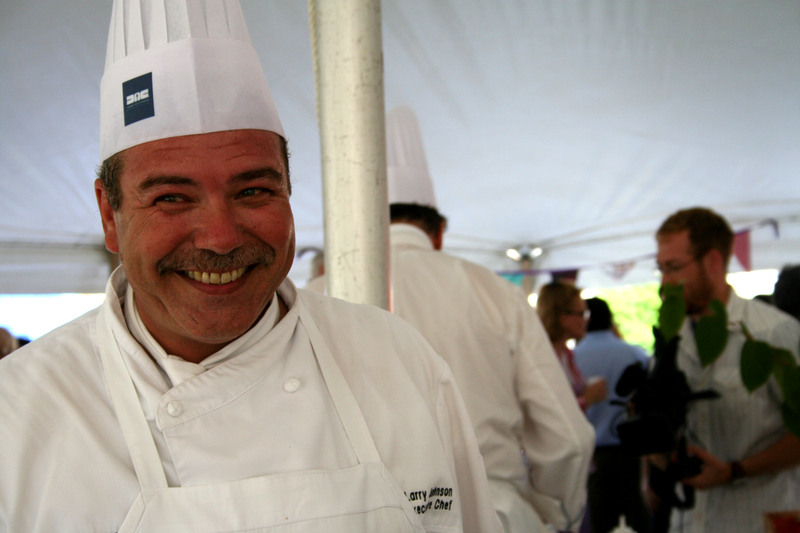 The other chefs who helped out were Chef John Davidson from Niagara Falls, Chef Scott Green from HSBC Arena, Chef Tab Daulton from Fairgrounds and Chef Larry Johnson at Ralph Wilson. Each of us created a recipe that incorporated the tilapia. We also had several new “sous-chefs” as the children who work with the program were on hand to help out. They were a huge help. One of the key focuses of the Massachusetts Avenue Project is working with children to teach them how to grow their own food, eat healthy and be leaders in their communities. I have to say a big thank you to everyone who helped. It really was a great time and an event I’d been looking forward to all summer long. The people who attended enjoyed music, food and free tours of the farm. All of the chefs and children who worked to prepare the food did an excellent job. 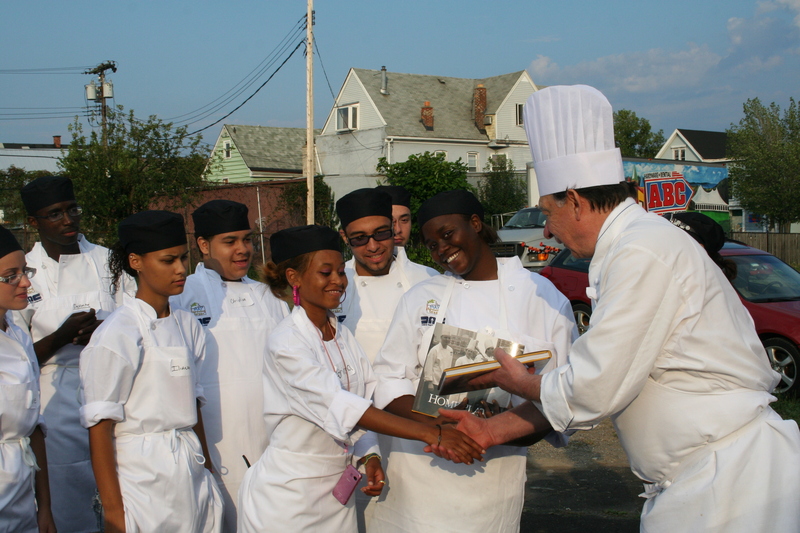 It was one of the many moments that makes me proud to be a chef and culinary teacher. There are several pictures I’ve included in this blog. Oh well, enough with the fishy business for now. I must catch a plane to Target Field to help with a dinner event. I will blog again soon. Working with the next generation of great chefs. This entry was posted on Friday, August 13th, 2010 at 1:45 am and is filed under Uncategorized. You can follow any responses to this entry through the RSS 2.0 feed. You can leave a response, or trackback from your own site.